Once a charming private home, where generations of the Russo family used to pass their summer holidays, Villa Franca has been recently transformed into an enchanting 4 star hotel, providing visitors to the Amalfi Coast with a luxurious coastal retreat on the hills overlooking Positano. Inspired by the area's ancient patrician residences, Villa Franca's light-filled bedrooms are decorated with exquisite wall paintings, artistic ceramics and brightly colored majolica floor tiles. The majority of the rooms have their own private terrace with view of the center of Positano and the sea. The hotel's 'Li Galli' restaurant provides the perfect introduction to the Amalfi Coast's flavor-packed cuisine, prepared using the finest locally sourced ingredients and same-day-fresh fish delivered direct to the restaurant kitchen by the local fishermen. In Villa Franca's A&G Russo wellness center guests enjoy moments of blissful relaxation and professional pampering, choosing from an excellent range of massages and beauty treatments. A fitness corner, equipped with the latest gym appliances, has been especially designed for holidaymakers keen to keep in shape whilst on vacation. Hotel Villa Franca is the ideal choice for those eager to explore the historic center of Positano and the other towns of the Amalfi Coast. Amalfi, Furore, Conca dei Marini and Praiano are, in fact, all just a short car, bus or boat ride away. In the last 30 days 37 people have visited this page. 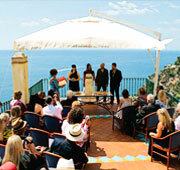 Make your dream wedding on the Amalfi Coast come true - just like Felicity Giuliani did!